It was an interesting week in WWE with Daniel Bryan signing a new contract and Shawn Michaels teasing a comeback. This is one of those weeks where there was a good mix of World Wrestling Entertainment content that was on my mind along with some news that makes me feel like covering it all in one fell swoop here with eight takeaways for the week. These are not in any order in terms of importance. I just feel like covering a bunch of different things and I figured this was a good way to do it. The main story on Raw this week was that that the heels on the show worked together to destroy the popular Shield trio of WWE Universal Champion Roman Reigns, Intercontinental Champion Seth Rollins and Dean Ambrose. Specifically, Braun Strowman led the way along with Drew McIntyre and Dolph Ziggler, who have become a three-man group. Strowman was in full heel mode during the show although he did not do the traditional heel wrestling promo where he blamed the crowd for his actions. Last week when I wrote about it, I still wasn’t sure if Strowman would be a heel, but that appears to be the case now. Strowman said that he knew he needed allies against Roman and The Shield, so that’s why he teamed up with McIntyre and Ziggler. It should set the stage for a rivalry between these two sides until the end of the year heading towards the Royal Rumble in January. At Hell in a Cell next week, Strowman challenges Reigns for the Universal Championship in a Hell in a Cell match. I don’t expect Reigns to lose the title one month after he won it, but if Strowman were the guy holding the title as a heel champion, it would make things more interesting on Raw. The best thing about the feud is that Raw has firmly established Strowman, McIntyre and Ziggler as a dominant group especially after McIntyre and Ziggler won the Raw Tag Team Titles last week. Raw needed that, so I’m perfectly fine with it. I hope it leads to a more exciting Raw product overall too. The WWE Evolution event on October 28 is the first-ever all women’s pay-per-view in WWE history. The first match they announced was Alexa Bliss vs. Trish Stratus a few weeks ago. This Monday, while Raw was going on, WWE announced on social media that former four-time Women’s Champion, and 2014 WWE Hall of Famer, Lita will face off against current WWE superstar Mickie James, who is a six-time Women’s Champion that will be in the WWE Hall of Fame one day. There’s an interesting backstory between the women because Mickie James beat Lita at Survivor Series 2006 to become the Women’s Champion for the second time. That was also Lita’s retirement match. Even though she retired twelve years ago, Lita is 43 and looked good at the Royal Rumble match earlier in the year. I’m not really worried about her looking like she is broken down or anything like that. Mickie just turned 39, she’s in awesome shape and they should be able to have a quality match together. I’m interested to see if Mickie will continue her current heel character for the match or if it will be a case of her getting the respect from the crowd and the fans cheering both women because they are legends. If Mickie is in the heel role still, perhaps they could have Lita and Trish team up against Alexa and Mickie on Raw a few weeks before Evolution to preview what the matches may look like. Who should win? I think Mickie should, but I don’t think it matters that much as long as they get to go for 10-15 minutes in front of a hot crowd. It was announced on Thursday that WWE will be releasing a book by journalists Craig Marks and Rob Tannenbaum that will be the first ever oral history of World Wrestling Entertainment. Here’s part of what was in the press release including comments from WWE Chairman and CEO Vince McMahon. It’s an interesting idea that should produce an outstanding book. We don’t know when the release date will be, so maybe we have to wait a year or more for this to come out. Whenever there’s something that is produced by WWE whether it’s a book or documentary, they are always going to hide from revealing too much while also putting them over. In this case, since the book is written by two journalists that don’t work for WWE, that means there’s a better chance for it to be a little more authentic in terms of how it is presented. A book covering the entire history of WWE will also be long. Could be in the range of 500 pages? Maybe 700 pages? I can’t imagine it will be a quick read. I’m intrigued by it, though. It sounds like a huge project that should produce some very interesting content. Here’s the lineup for WWE Hell in a Cell next Sunday, September 16 in San Antonio. I’ll have an in-depth predictions column in a week. There will be another four or five matches added because that’s the standard for WWE shows this year. If I had to rank them in order of my interest level, I’d put Charlotte vs. Becky at the top because I’m intrigued by the match quality, it should be awesome and I think the crowd will support Becky even though she’s been booked as a heel in the feud. I also think the build for AJ Styles vs. Samoa Joe has been outstanding with Joe making it a personal feud by trash talking AJ about his family, mentioning AJ’s wife Wendy, his daughter Annie and no mention of AJ’s three sons. By making it personal, the intensity has picked up, so it feels like a personal feud for a title rather than a match between two guys randomly put together because it’s for a title. I think Joe might win the title too. Reigns beating Strowman seems obvious because Reigns losing the title so soon is unlikely, so I’m not that interested in it. They have had good matches in the past. The other HIAC match should lead to Jeff Hardy doing some crazy dive in his first HIAC match. I just hope he’s smart about it. My interest in Rousey vs. Bliss is pretty low because it just feels like an easy win for Rousey. Bliss might put up more of a fight than the quick match they had at SummerSlam. As for the mixed tag team match, it seems obvious that will be a win for Bryan and Brie to get revenge against Miz and Maryse cheating to help Miz win at SummerSlam. The second edition of WWE’s Mae Young Classic started on WWE Network on Wednesday after NXT. You can find it on demand in case you missed it. I don’t think there’s as much excitement surrounding the tournament this year likely because last year was the first year where it took place. Last year was also when Ronda Rousey started appearing more frequently at WWE events. Rousey started training for a WWE debut last summer although WWE didn’t let us know that at the time. This year, there just isn’t as much in terms of WWE pushing it as a big deal. It exists, but it feels like a repeat. It does show WWE’s commitment to women’s wrestling, though. There are several women in the tournament to keep an eye on like veteran Japanese star Meiko Satomura, Teagan Nox really impressed me, Toni Storm has an extremely bright future and then I want to see some familiar names like former Divas Champion Kaitlyn along with long time Impact Wrestling star Madison Rayne. It’s a good group of talent, so check it out if you are interested in women’s wrestling. 3. Shawn Michaels may have his first match in eight years in…Saudi Arabia? The most interesting segment on Raw this week involved 53-year-old retired WWE Hall of Famer Shawn Michaels, who is my favorite wrestler ever. Michaels was in the ring talking about how Triple H is going to beat The Undertaker at the Australian Super Show-Down event on October (available on WWE Network). That led to a surprise appearance from The Undertaker, which drew a huge ovation from the Columbus, Ohio crowd because he was not advertised. It was known among us in the internet wrestling community, but WWE kept it quiet. During the Michaels/Undertaker face off in the ring, Undertaker said that he thinks Michaels picked Triple H because Michaels is still upset that Undertaker retired Michaels at WrestleMania 26 in 2010. Michaels pointed out that he respected Undertaker and that he shows that respect by not unretiring like so many others have done in wrestling. Undertaker questioned whether Michaels was telling the truth or whether he was afraid of coming back to wrestling. The segment got people talking because it’s been eight years since Michaels has had a wrestling match. Does he have another match or more in him? Apparently so. According to the Wrestling Observer Newsletter (available via subscription at wrestlingobserver.com), the plan is for Michaels to wrestle in a tag team match at WWE’s next Saudi Arabia show on November 2. Michaels current role in WWE is as a coach for NXT talent in Orlando, so he’s still working for the company. My first thought is…really? It seems weird to me. Then again, you must remember that WWE was reportedly paid about $40 million to do the last Saudi Arabia show in April, so if they are getting close to that this time then it makes sense for them to try to convince Michaels to wrestle at least one more time. I would assume that Michaels would team with his best friend Triple H possibly against younger heels, but maybe it would be The Undertaker and Kane, who is now the mayor of Knox County, TN. It’s a wait and see kind of thing for now. It looks like Michaels coming back for at least one more match is a go, though. After Super Show-Down, I would also expect Michaels to wrestle at WrestleMania and perhaps that will be against The Undertaker one more time. There are several other potential matches for Michaels too. I’ll mention one of them later. Here’s a listing of WWE content that WWE wants us to watch over a four-day stretch. I’ll use next weekend as an example because there’s a PPV as well as the second season of Mixed Match Challenge. September 16: Hell in a Cell on WWE Network for five hours counting the Kickoff Show, which is one hour and the main show is four hours. September 17: Monday Night Raw for three hours. That’s a total of 13 hours and 30 minutes over the course of four days. I’m a WWE superfan that also gets to write about it for a living, but even I can’t consume that much. I know a lot of people that only watch Raw or only watch SmackDown and even then it’s on DVR. It’s tough to find time for all of that. The timing is also bad for WWE because the month of September means the return of major sports like the NFL having primetime games three nights per week and college football while first-run television shows return. The month of October won’t slow down either because they’ve got the Australian Super Show-Down event on October 6 and Evolution on October 28. I want to make it clear that I’m not complaining. The cost for all that content is cheap because Raw and SmackDown are on cable while the other stuff is on the low-priced WWE Network for the price of $9.99 in the US. It’s not that bad at all. All I’m saying is that sometimes less is more, but WWE obviously feels comfortable producing as much in-ring content as they have ever had. 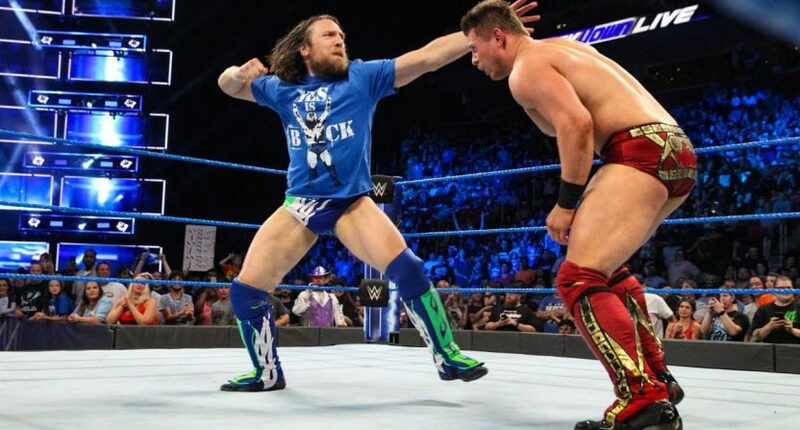 Back in January, I wrote a column for The Comeback about Daniel Bryan. I wrote about how questions about Daniel Bryan’s future would be answered this year. Could he wrestle again in a WWE ring? The answer to that was a yes in March. The other big question was, would Bryan re-sign with WWE when his contract is up in September? That answer is a yes too. It was reported by the Wrestling Observer that Bryan had re-signed with WWE this week. His contract was up on September 1st, so that’s why it was done this week. The news of Bryan staying with WWE doesn’t surprise me at all. At 37, with millions in the bank after having built a championship legacy in WWE, two reality shows co-produced by WWE (Total Divas and Total Bellas) starring Bryan and his wife Brie Bella (along with daughter Birdie), it wouldn’t have made sense for Bryan to go work independent wrestling shows again. Bryan did that for over a decade before WWE, so why go back to it? Plus, Bryan had the leverage in this case. Bryan doesn’t want to work a full-time schedule where he’s on the road for 20 days a month. We don’t know the details yet, but I assume Bryan is going to get some weekends off and obviously be booked on SmackDown as well as PPV events. If he were to work ten days a month for a very good salary, I would imagine that would be fine with him. What I’m interested in the most with Bryan is where things go from here. Does WWE management have enough faith in him to push him to win the WWE Title one more time? It’s not like Bryan is that old that he can’t have another one, two, three or more WWE Title reigns. It’s more of a question of if WWE feels like they can rely on him in that role even with a limited live events schedule. I would love to see Bryan do something he has never done before: Win the Royal Rumble. It would be a great sight to see Bryan win the Rumble in January, earn a WWE Title match (or Universal Title) and win a major title at a WrestleMania again. It would make the comeback story complete since he returned at this year’s WrestleMania. Whether WWE pulls the trigger on that, I don’t know, but it’s definitely something I would do. One final thought. The two men that were the main subject of this column were Shawn Michaels and Daniel Bryan. Michaels helped train Bryan to wrestle nearly 20 years ago. They never had a match together even though it was teased in an angle in 2013. How about Michaels vs. Bryan at WrestleMania next year? Sounds like a dream match come true to me. That’s all for this week. I’ll be back next week for Hell in a Cell predictions.